This holiday season, give yourself (and your home) the gift of a new look. Our beams, mantels and other products are available in a wide range of textures and colors to enhance any style -- Contemporary, Farmhouse, Mediterranean, Southwest and more. Whether you're looking for a simple fireplace mantel or something more elaborate, these five projects may jingle your bell. A truss like this built with solid wood beams would be extremely costly in both materials and labor, not to mention time-consuming. Our lightweight beams make creating a truss exponentially easier, while retaining an authentic wood look. Jack wanted to give his stone facade fireplace more of a rugged, farmhouse-style motif, but the old mantel wasn't quite up to snuff. He solved this by ordering one of our mantels in a slightly larger size to easily slip over the original. While our ceiling beams work very nicely in rooms with darker decors, they also look great when you're looking to create a little contrast. Like this kitchen remodeled by North Shore Kitchens in Pittsburgh, PA. With all new cabinets, flooring, countertops and a subway tile backsplash, lead designer Sarah Doliboa smartly accented the light color scheme with beams stained in rich walnut. It's not often that customers send us panoramic shots, and we were excited to get this one from Monique D. She calls it a finished basement, but it's more of an apartment with a kitchenette, a cozy TV area, bunk beds and if you look the way to the right, a fully-equipped, glassed-in gym. 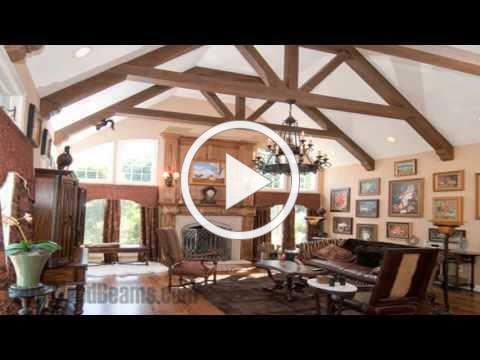 It's an incredibly cool project, and we were thrilled our beams played a part. I just wanted to reach out with pictures from our finished basement in which we used Woodland Beams in Java to cover the steel poles, and to add to our ceiling. They worked great and added so much to our design. This stunning Tudor-style manor was built in Ocala, FL. The homeowners wanted to add decorative trusses to the gables that fit the architecture, but needed materials that would withstand Florida's high humidity and insects without constant maintenance. 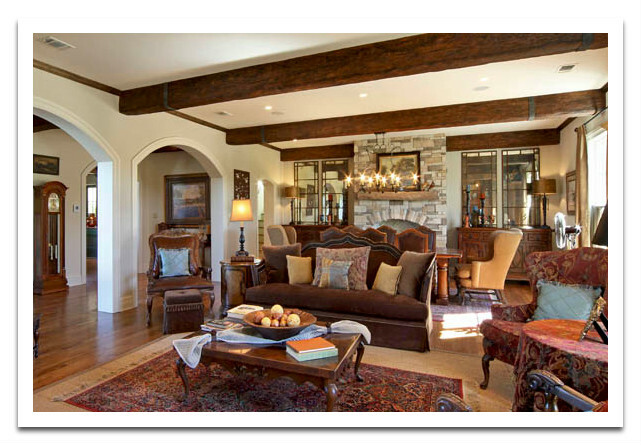 Faux wood beams provided the solution.